Another worker who treated Liberian man who brought virus to US comes down with the lethal disease. A second health care worker in Dallas who took care of Thomas Eric Duncan of Liberia, who died last week after bring Ebola to America, was diagnosed with the lethal virus on Wednesday. 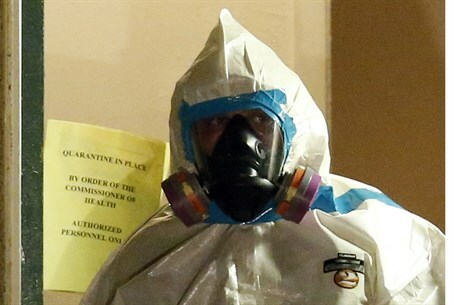 This makes the second case of Ebola being contracted in the US during the current outbreak, after 26-year-old nurse Nina Pham who likewise treated Duncan came down with the virus. After Pham contracted the disease, in what was called a failure of protocol, Centers for Disease Control and Prevention (CDC) director Dr. Thomas Frieden announced a five-part plan “to prevent how this occurred from happening again," a recurrence which unfortunately took place anyway. The second worker's identity has yet to be released, reports BBC, adding that the worker was immediately isolated after complaining of a fever on Tuesday. "Health officials have interviewed the latest patient to quickly identify any contacts or potential exposures, and those people will be monitored," the Texas Health Department said in a statement. Forty-eight contacts of Duncan and healthcare workers who treated him are being monitored, amid fears that the disease that has already killed over 4,447 people since December may spread further outside of West Africa. Pham was reportedly in good condition on Tuesday as she continues to undergo treatment, including plasma transfusions from Dr. Kent Brantly, who survived the virus recently. Brantly's blood was previously donated to Dr. Rick Sacra, who survived his brush with the dease, and Ashoka Mukpo, a freelance NBC News cameraman who got the disease on his first day on the job in Liberia. While Pham may have been the first to contract the disease in America, a Spanish nurse became the first to contract it outside of West Africa last week - she remains in critical condition but reportedly has shown improvement. The World Health Organization (WHO) on Tuesday warned that the total number of those infected by the disease will pass 9,000 this week, and that by December the number of infections every single week in West Africa is liable to skyrocket to 10,000 people.